Cornelius has long been known for its agriculture heritage and continues to serve the farming community throughout the Portland metro area. While this area has experienced tremendous growth, affordable housing to meet the needs of the community was lacking. Heritage Bank, along with the city of Cornelius and development partners BRIDGE Housing and Bienestar, is proud to be part of the opening of a mixed-use, three-story building offering affordable housing, a new state-of-the-art library, and YMCA. The two apartment floors are open to seniors whose income qualify for affordable housing and will include accommodations for mobility and/or hearing impairment. A grand opening on March 30, 2019 marks a sweet celebration that at first struggled to get off the ground. For more insight on the project, let’s chat with Kathy Swift, senior vice president – nonprofit development officer, at Heritage Bank in Portland. Q: How long did the financing process take from start to finish? Technically, the project started in 2014-15. Because of the unique nature of the partnerships, it was a bit more complicated to finance the construction. The banks that were initially approached turned it down. Heritage Bank stepped in around 2017, which helped bring the project to completion in March 2019. Q: What makes Heritage Bank’s ability to finance the project different than other banks? Heritage Bank was able to use creative financing with BRIDGE Housing and the city of Cornelius to structure a $10 million-dollar loan for the construction of the building and a tax credit investment for the housing portion. This unique approach made the difference that helped the transaction to move forward. Q: Is this normal operating procedure for Heritage Bank? Yes. Heritage Bank’s belief since its founding is that our communities grow stronger when banks and neighbors work together. It’s a relationship. We are, after all, a community of banks. Our relationships with and understanding of our clients are what makes us unique. Q: What makes this project so special? The building is across the street from an elementary school. There will be inter-generational cooperation with volunteer opportunities for senior residents to interact with the kids at the elementary school as well as the library and YMCA. The building’s location puts seniors in the heart of the community with Bienestar, El Centro Cultural, and other culturally specific support close by. It is also the start of Heritage Bank’s commitment in the city for affordable housing—and bringing communities like this one together. 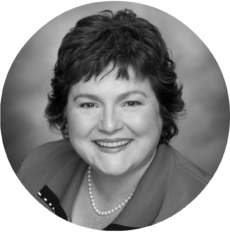 Kathy Swift is the senior vice president – nonprofit development officer at Heritage Bank in Portland, Oregon. Kathy has 35 years of banking experience as well as expertise managing a portfolio of both for-profit and nonprofit companies, including real estate loans, lines of credit, tax-advantaged bonds, and affordable housing credits. She serves as a board member for Catholic Charities of Oregon, Jesuit Volunteer Corps Northwest, the Parish Trust Fund for the Archdiocese of Western Oregon, and Portland Community Reinvestment Initiative (PCRI). She also works with Save First, a financial wellness nonprofit for families, and Cascadia Behavioral Healthcare, which provides housing and mental health services throughout the Portland area.